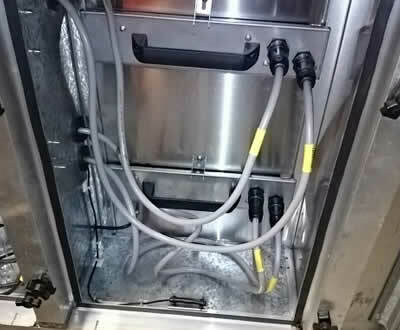 A clean and efficiently running kitchen exhaust system is surprisingly easy to achieve. Take a few simple steps and you will be well on the way to removing fire and health risks and saving yourself hundreds if not thousands of dollars along the way. 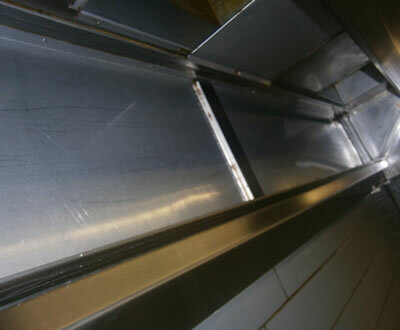 The above steps form the basis of Kleenduct's unique "Clean as Need" approach to the preventative maintenance of kitchen exhaust systems. It's recommended that the inspections be carried out monthly and if you are using us for your complete maintenance (filter exchange, canopy, duct & fan cleaning) it will be provided at no cost. *Based on AS 1851-2012 Tables 13.4.1.16 and 13.4.1.17 (Monthly and Yearly Routine Service Schedule Fire and Smoke Control Features of Mechanical Services Kitchen Exhaust Systems). Once they start filling up with grease they are no longer able to do their intended job. 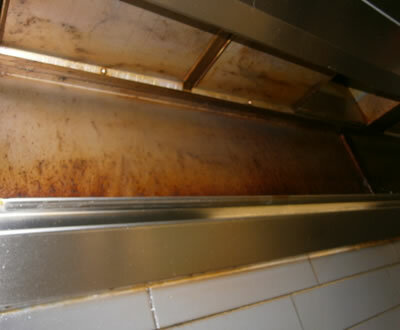 You will start to get a grease build up in the gutters that may well leak back onto your cooking, down the splashbacks and other areas in the immediate vicinity leading to what we call "grease bleeding syndrome". Risk – This represents a high risk as the whole system is now basically a fire that's waiting to happen. 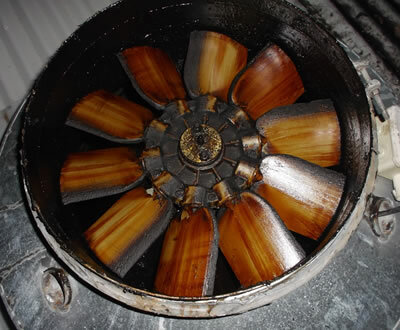 The filter's job is to stop grease from entering the plenum/holding chamber and consequently the ducts. 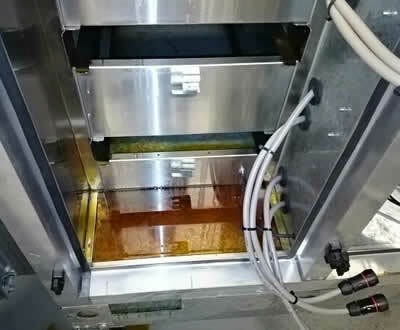 If the filter is full of grease, the grease will keep accumulating in the gutters and the chamber and will consequently be drawn into the ductwork by the exhaust fan. 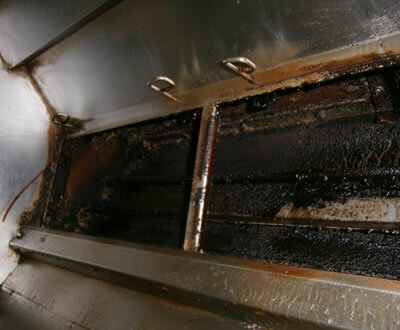 Filter cleaning/exchange – In an ideal world the filters will be exchanged/cleaned on a need to clean basis as dictated by the volume and type of cooking and the results of your inspections. The areas behind the filters the plenum/holding chamber, the ductwork and the fan will remain clean for extended periods of time. It is recommended that you use the same service provider for both the filter cleaning/exchange as for your canopy, ductwork and fan cleaning. It’s very frustrating for a duct cleaner to have to replace dirty filters into a just cleaned canopy. Obviously if they are really dirty they will start to “bleed” straight away and you might well wonder if the duct cleaner has even done their job. In the majority of cases filter cleaning cannot be done on site as this opposes by-laws and regulations. Filters can contain large volumes of grease that should not be washed down the drain. Cost effective – Having the filters cleaned on a regular basis is cost-effective. Filter cleaning/exchange is relatively inexpensive when put into perspective. If all has gone to plan you will only need a thorough clean of the whole system once a year. If the filters have not been cleaned regularly or at an appropriate frequency you could be looking at a complete clean up to four times a year. It’s not hard to calculate the cost savings represented by an efficient and regular filter cleaning programme. Now servicing all areas, and every type of air and odour management systems. Our total approach includes cleaning of UV banks, electrostatic filter cleaning/exchange, cleaning of holding unit, replacement of pleated panel pre-filters, carbon filters. Cleaning of chamber and re-instate unit. Cosmetic Canopy Clean - In most cases can be easily accessed for a good clean. You should be fully informed of what you are getting for your money and if two quotes vary dramatically – there will be a good reason. A cosmetic to clean only involves cleaning what you can see. Deep Canopy Clean - If you've reached a point with your inspections that tell you a clean is required then the interior areas of the canopy need to be cleaned also. 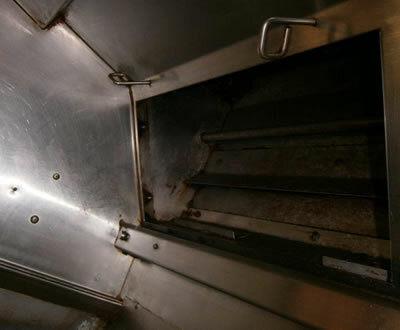 Filters will be removed, boards will be placed over stove tops and benches and the whole interior of the canopy should be thoroughly cleaned all the way to the initial ductwork and as far as accessible up the ductwork. Horizontal ductwork exists when a straight run to the exhaust fan can't be achieved or when the duct has to pick up a couple of kitchens on its way to the exhaust fan. A cost effective and efficient means of assessing the need to clean is to use an inspection Camera. Most duct cleaners offer this alternative now and these cameras are capable of giving excellent high quality imagery. Most risers will not have a huge build-up and the inspection cameras are really great for determining the need to clean without question. They are also great for spotting leaks and other mechanical problems that may exist. Thankfully most risers can be cleaned. The only impediment is lack of access, and access has to be addressed to enable a thorough clean. The fan will be isolated; the housing will be removed where possible and cleaned internally and externally. 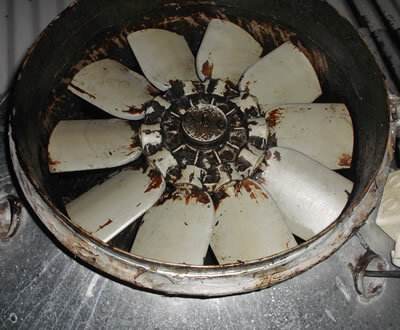 The fan blades will be cleaned front and back and the ductwork will be cleaned as far as is possible. The isolator will be removed and the fan run for a few minutes to ensure proper operation. Remove this unsightly and unhygienic problem once and for all with a regular clean. Your professional Duct Technician can provide you with a quote. Using a combination of degreaser and hot water pressure (where available) the roof area surrounding the fan will be returned to an acceptable standard. You will be provided with before and after photos and a service report.